Since 1986, when Ultramax was first created, we have dedicated ourselves to providing a top quality product at a fair market value. We back up what we sell with honest business dealings and fast, friendly customer service. This combination has built Ultramax into one of the ammunition industry's leading suppliers. In shooting sports-whether you specialize in hunting, cowboy action, or aim to be the next Olympic gold medalist-accuracy and consistency are important. We take great care with Quality Assurance to build accuracy and consistency into every round. 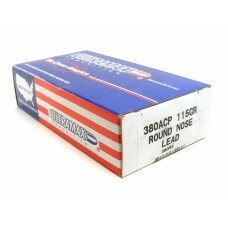 Box of 50 Ultramax Ammuntion .380 ACP 115 Grain Lead Round Nose cartridges. Great for practice and t..